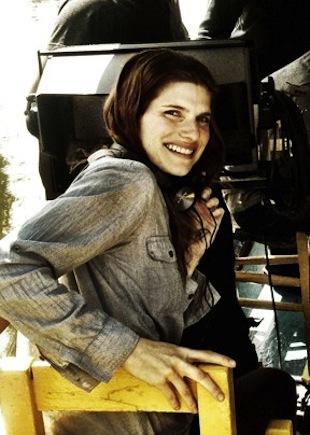 Director Lake Bell on the set of her film 'In a World...,' which was selected for the U.S. Dramatic Competition at the 2013 Sundance Film Festival. Director Lynn Shelton, whose film 'Touchy Feely' was selected for competition at the 2013 Sundance Film Festival, poses for a portrait in Park City. When I was a film student at Columbia College Chicago, I had only one expectation on the first day of class each semester: I will be in the minority. Sure enough, I&apos;d walk in and see an overwhelming majority of dudes staring back at me, surprised by my femininity and clearly skeptical of my abilities as a director. In many of my classes, I was the only girl in the room. Last weekend, Columbia College hosted a series of events in Park City, Utah for the opening of the 2013 Sundance Film Festival. This year, for the first time ever, half of the films in the U.S. Dramatic Competition were directed by women (8 out of 16, to be exact). I wonder if any female students were inspired by watching these films onscreen, knowing that at least eight more holes have been blasted through their glass ceiling. Still, women have a long way to go before acheiving the same status that men have long held as directors. Even though one-time Oscar winner Kathryn Bigelow directed arguably the best film of 2012 (Zero Dark Thirty, a modern masterpiece about the hunt for Osama Bin Laden), the Academy snubbed her for Best Director in favor of an all-boys club once again. A recent study from the University of Southern California also shows a marked discrepancy between genders: male directors outnumber their female counterparts 15.24 to 1, and the numbers don&apos;t seem to be budging anytime soon. Except in Park City, that is, where women are evenly matched with men in both the documentary and dramatic film categories. Sure, the statistics don&apos;t look great for female directors in Hollywood. But if the turnout at Sundance is any indication, more women are being acknowledged for their documentaries, indies and arthouse films than ever before. Actress-filmmaker Sarah Polley (Away from Her, Take This Waltz), whose well-received documentary Stories We Tell gained entry into Sundance&apos;s Spotlight program this year, has noticed a steady rise in female confidantes since she first started coming to the festival in 2000. "I feel like there&apos;s been a seismic shift," Polley said. "My first time at Sundance, I spent the whole time just trying to find other female filmmakers. Now you see there&apos;s been huge progress." Director Lynn Shelton (Humpday, My Sister&apos;s Sister) is showing her latest film Touchy Feely at both the U.S. Dramatic Competition in Park City and the Music Box Theatre&apos;s Sundance in Chicago event on Jan. 31. As a champion for female voices in a male-dominated industry, Shelton believes that the increased presence of women at Sundance bodes well for the future. "It just feels like justice," she said. "Like, OK, this is the way it&apos;s supposed to be. This reflects the population of the earth. There&apos;s no reason why there shouldn&apos;t be as many women making movies as men. But I&apos;m also waiting for the day when I&apos;m not treated as an oddity as a woman. I&apos;m just treated as another filmmaker."